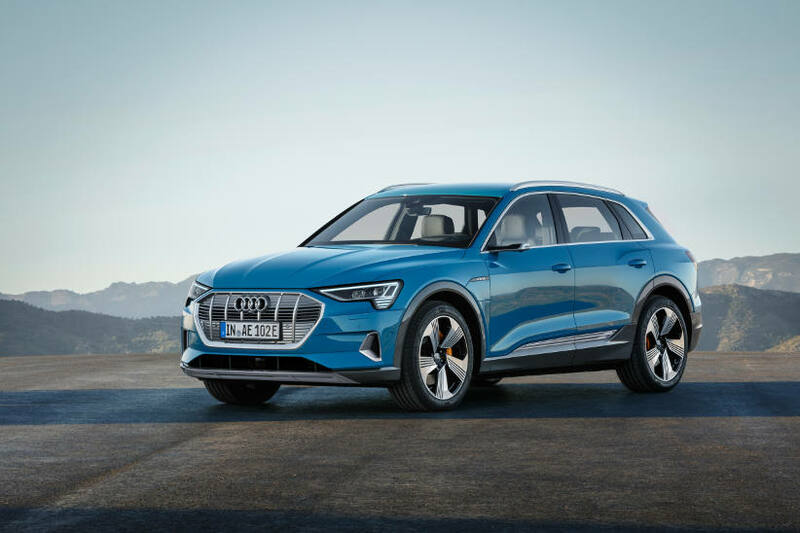 2019 Audi e-tron electric SUV for sport, family and leisure. The Audi e-tron is an electric SUV for sport, family and leisure. It is 4901 millimetres long, 1935 millimetres wide and 1616 millimetres high and offers the spaciousness and comfort of one of the brand’s typical full-size models. With a wheelbase of 2928 millimetres, the Audi e-tron has ample space for five occupants and total luggage capacity of 660 litres. A key factor for the sporty character and outstanding dynamics is the low and central installation of the drive components. The battery system is optimally matched to the dimensions of the Audi e-tron and is located between the axles in the form of a flat, broad block beneath the passenger compartment. That makes the Audi e-tron’s centre of gravity similar to that of a sedan, with axle load distribution perfectly balanced at almost 50:50. The wheel brakes do not come into play until the driver uses the brake pedal to decelerate with more than 0.3 g, and then they react extremely quickly thanks to a new electrohydraulic actuation concept. Audi is the first carmaker worldwide to employ this in an electric-powered series-production model. When braking from 100km/h, for example, the Audi e-tron can recuperate electric power with a maximum of 300Nm and 220kW, which corresponds to more than 70 percent of its operating energy input – greater than any other series production model. The electrohydraulically integrated brake control system decides as a function of the driving situation whether the e-tron uses the electric motor, wheel brake or a combination of the two for recuperation – with this taking place individually at each axle. The transition between electric and hydraulic braking is so smooth the driver does not even notice it. The Audi e-tron reflects the Audi design language, translated into the electric age with new distinctive details. Typically for one of the brand’s SUV models, the Audi e-tron bears the octagonal-design Singleframe grille with vertical struts, largely enclosed and presented in platinum grey, identifying it as a fully electric model. At the lower edge of the Matrix LED headlights, four horizontal struts create the e-tron-specific signature in the daytime running lights. For the first time this is integrated directly into the headlights. The expressive design of the sill area with the black inserts visualises the location of the battery and thus the energy centre of the Audi e-tron. At the rear, slats in the wide diffuser call attention to the absence of exhaust pipes. The e-tron logo on the charging flap and optionally the brake calipers stand out in the high-voltage signal colour orange. Colourful accents are also available for the spacious, airy interior, whose design embodies performance, intelligence and lightness. The large arc which houses the optional virtual exterior mirrors, stretches across the expansive instrument panel to the sculptured door trims, taking in-car digitalisation to a whole new level. The centre tunnel console rests on open sidewalls, with the hand rest and integrated shifter positioned above it, allowing the driver to operate it with thumb and forefinger. The entire driver’s area has a driver bias, and the two large MMI touch screens are angled in the driver’s direction, replacing nearly every conventional switch and control. Many functions can also be controlled via the natural voice control system and with the standard Audi virtual cockpit, the driver can choose between two views that clearly present all information in the form of sharp, high-resolution graphics. The optional Audi virtual cockpit plus offers a third screen that highlights the electric drive system.